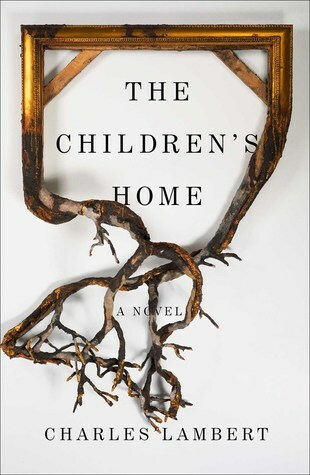 Charles Lambert’s The Children’s Home. 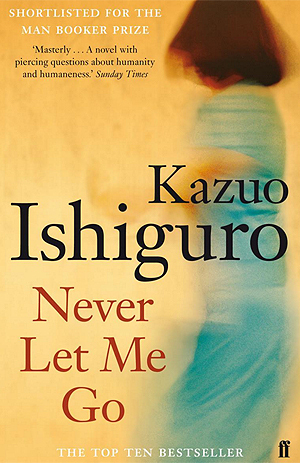 This is a book about a man living in isolation due to a horrific facial disfigurement, whose life is disrupted by the mysterious arrival of a group of children who turn up one by one as if from nowhere. In many ways the setting feels contemporary but as we learn more we discover that something terrible has happened to the world – something hugely destructive that has left people in fear and caused the rich to retreat behind heavily guarded walls. Shirley Jackson’s We Have Always Lived in the Castle, about two women living in a house where a horrific crime had been committed. 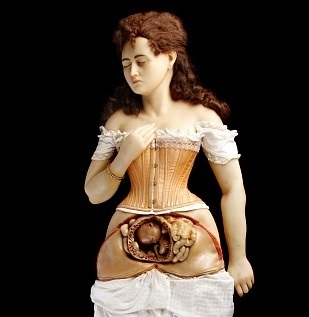 The villagers are sure that the older sister, Constance, poisoned most of her family; while through Merricat, the younger sister’s, eyes we see how the women isolate themselves from the outside world. Merricat is a wonderful creation and I love how Jackson inverts the usual Gothic themes. 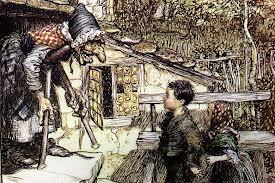 The book reads to me like the ‘true’ story behind the old witch tales, but seen from the perspective of the witch – I came to believe the castle may have been made of gingerbread. 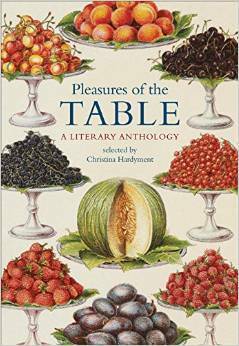 Pleasures of the Table: A Literary Anthology edited by Christina Hardyment which contains, amongst a feast of other goodies, Emily Dickinson’s recipe for Gingerbread. This anthology is filled with excerpts and quotes from literature, poetry and recipe books, and is gorgeously illustrated from the British Library’s own collection, often the specific illustrations that accompanied the original text. 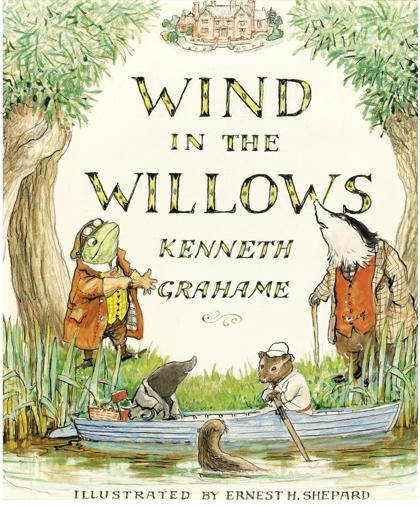 The Wind in the Willows by Kenneth Grahame. This is a book I have always loved and return to regularly. It’s not for the story of Mr Toad of Toad Hall that I love it, fun though that is. The chapters I love most are the ones that explore Ratty and Mole’s friendship, the sense of community amongst the heavily anthropomorphised animals (even as a child I knew that they were people really), the attractions of travel, the comfort of and longing for home. Today, to him gazing South with a new-born need stirring in his heart, the clear sky over their long low outline seemed to pulsate with promise; to-day, the unseen was everything, the unknown the only real fact of life. On this side of the hills was now the real blank, on the other lay the crowded and coloured panorama that his inner eye was seeing so clearly. What seas lay beyond, green, leaping and crested! What sun-bathed coasts, along which the white villas glittered against the olive woods! What quiet harbours, thronged with gallant shipping bound for purple islands of wine and spice, islands set low in languorous waters! 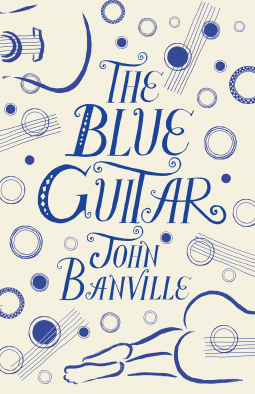 John Banville’s The Blue Guitar. This book was my introduction to Banville. It tells the tale of narcissistic but loveable Olly Orme, who stole his friend’s wife and is hiding from the consequences. Many long-term fans felt this one didn’t have as much substance as some of his earlier books, but I was dazzled by the beauty and sparkling wit of the prose and the wonderfully entertaining, quirky character Banville created in Olly. What I saw, with jarring clarity, was that there is no such thing as woman. Woman, I realised, is a thing of legend, a phantasm who flies through the world, settling here and there on this or that unsuspecting mortal female, whom she turns, briefly but momentously, into an object of yearning, veneration and terror. Each long black hair upon his head hung down as straight as any plummet line; but rumpled tufts were on the arches of his eyes, as if the crow whose foot was deeply printed in the corners, had pecked and torn them in a savage recognition of his kindred nature as a bird of prey. 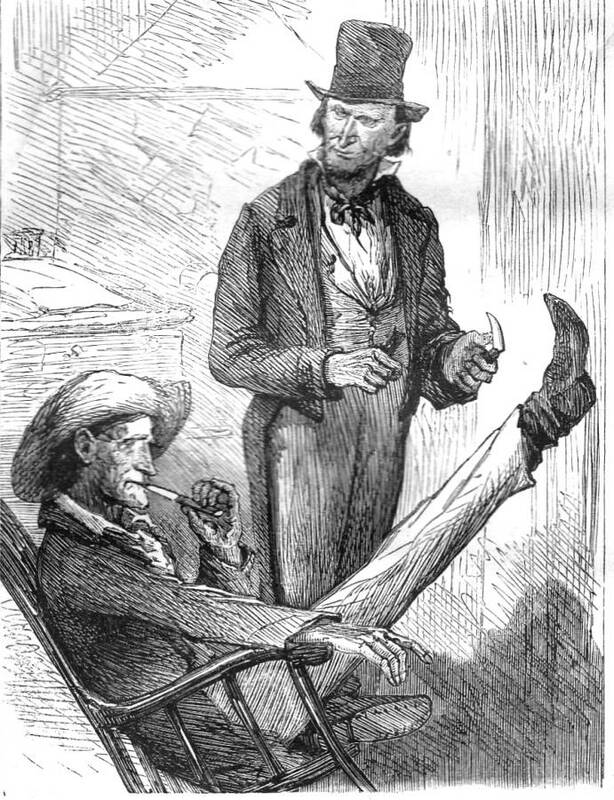 General Choke and Mr Scadder by Sol Eytinge, Jr. I did enjoy the journey thanks. And your chain of stories made me think of Anthony Marra’s Tsar of Love and Techno – linked short stories which resonate back and forwards to the stories before and after – bleak and uplifting. Glad you enjoyed it! Oh, I haven’t come across that one, but have just checked out the blurb – looks intriguing! I don’t think I’m up to ‘bleak’ at the moment what with Brexit and Trump and all, but I’ll stick it on the wishlist for when my joie de vivre returns 😉 Thanks for the recommendation! Terry’s little feet have been freezing! He comes up and nonchalantly puts them on him when I’m not looking. Naughty little furry things – can’t help but love them, though! Brilliant!!! A great idea for a post! And I appreciated your book choices! 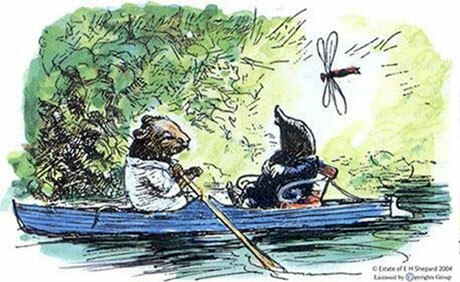 I generally reread The Wind in the Willows at least once a year. Very clever, FIctionFan! I think what especially impresses me is the variety of books that you’ve chosen – from all over the spectrum, really. It looks like you had doing it, too, which is even better. You know, I’m probably being supremely arrogant, but I really can’t imagine that any dedicated reader of a wide range of fiction of reasonable quality and matter could in a million years espouse inward looking ‘populism’ Fiction, especially from or about other lands and times, or even imaginary worlds and times, whether the writing or the reading, forces an engagement with ‘the other’ . AND forces self-reflection and the thinking about what you are reading, not just a knee jerk response. If I ruled the world………….and was interviewing successors, I would question them about their reading habits. You’ll pass muster, I’ll put you on the A list….Wind In The Willows shows early introduction to the understanding of ‘other’. If only Badger had stood…………or Ratty and Mole on a combined ‘friendship matters, especially friends who are quite different’ . I think any meme of mine at the moment would be dreadfully gloomy.it’s probably time to dig out Wodehouse……. I did go to bed…with the radio, and kept waking every half hour or so to turn it on, and hurriedly turn it off in despair, drifting off for a short while, waking with a bad dream, wondering if it had all been a bad dream and turning on the radio again, ad infinitum. I had an awfully bad feeling about this one even before the results which would begin to show things filtered through. I have a whole stack of books to review and just have lacked any oomph to do it for a while, all down to depressing following on the news. If only there was a way to kidnap dangerously aggressive and stupid arrogant political demagogues, bundle them into a rocket and fire them off into space, with no astronauts on board, unhackable controls, and insufficient fuel to do anything except get them outside the earth’s gravitational field. IS education still helping to develop thinking, or is it just another tick box whose goes is ‘passing an exam’ so that what is being learned is exactly that? I suspect the latter – in some universities anyway, and on some courses. Maybe the old universities still try – or maybe I’m just getting old and grumpy! Well, yes, it was a rhetorical question, and invited the answer you gave. I have certainly seen changes over the years I have been involved in adult education. It seems harder to get people to think for themselves, and there is a great tendency to cite the sources (fine, nothing wrong with reading round) but not try out analysis through a kind of self-reflection. Or maybe I’m just getting old and grumpy and want more than just to read what the same source is saying, over and over! Yes, I’ve noticed much more emphasis on source-citing too. I don’t particularly remember that as part of my own Uni experience. I think we were supposed to read and absorb the sources and then produce our own interpretation rather than direct citing. PS – you haven’t by any chance, got a pantechnicon of scrumptious gingerbread to spare, have you? Sadly not, but you’re welcome to a choc-chip mini-muffin! 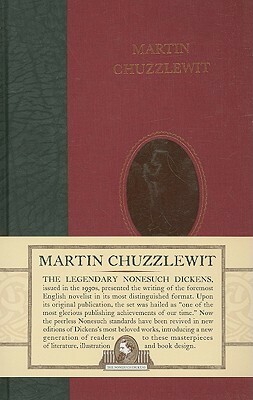 I love the way Dickens describes things and people so that you can actually see them. The problem is that most writers end up being a bit dull if they describe things at length – it’s his great use of language that makes it work. Thank you – a good way to fill up space during my reading slump! Did you get snow?? Do the kitties hate it on their little feet?! Yes, first of the year! But it thawed within a few hours. Funnily enough, they don’t seem to mind the snow as much as rain, but they like to come and heat their wet, muddy feet up all over my clothes when they come in! Aw, you’re their fuzzy towel — so cute!! interesting idea, which I may try someday. Teddy and I have retired to bed with a roast beef sandwich – comfort eating much? This is why I read so much fantasy – reality is getting too much for me. Fortunately, I have chocolate…….. I can’t seem to muster a coherent thought today… but I enjoyed your post. I can’t say you didn’t warn us with the Brexit deal. I can’t even eat chocolate…. What a great chain and so beautifully presented. 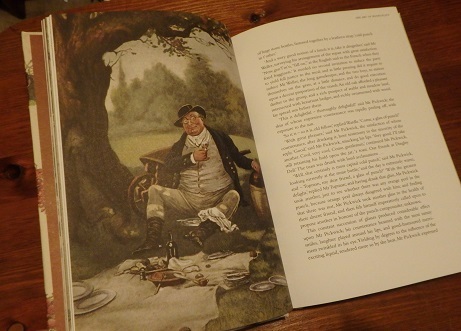 Wind in the Willows was a surprise because the previous title had me thinking of food books–and food and chocolate! I love where Kate’s prompt is leading everyone. What a journey it was – I love how everyone takes such different leaps in this meme – yours were both inspired and gave a real sense of the books you chose – of course I particularly loved the Wind in the Willows stop. Thanks so much for joining in. I love your little ‘extras’ – that wax model is really creepy (and if you do like creepy books, Never Let Me Go is a ripper). I’d been meaning to hunt down Pleasures of the Table – thanks for the reminder. And I love that it lead you to Wind in the Willows – I have a soft spot for that book as it’s the first ‘chapter’ book that I remember being read to me (by my dad, a little each night for what felt like weeks).